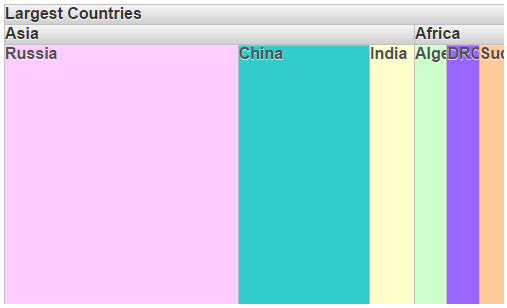 The regions of a TreeMap can be displayed as squares, horizontal rectangles or vertical rectangles. This can be changed with the help of Type property of the TreeMap. This topic uses the sample created in the Quick Start topic. Right click the TreeMap control and select Properties to open the Properties Window. Set the Type property as per your requirement. The property is set to Squarified by default. In the Tooltip property, set the text that you want to display when you hover the mouse over the titles in the control. Add the following code to the Page_Load event, to set the ShowTooltips property to true and to set the tooltip text. When you run the project, notice that the area of the TreeMap is divided in vertical rectangular regions, instead of square regions.